Thrifty Wife, Happy Life: My Closet- Christmas Look with Red Houndstooth Skirt. 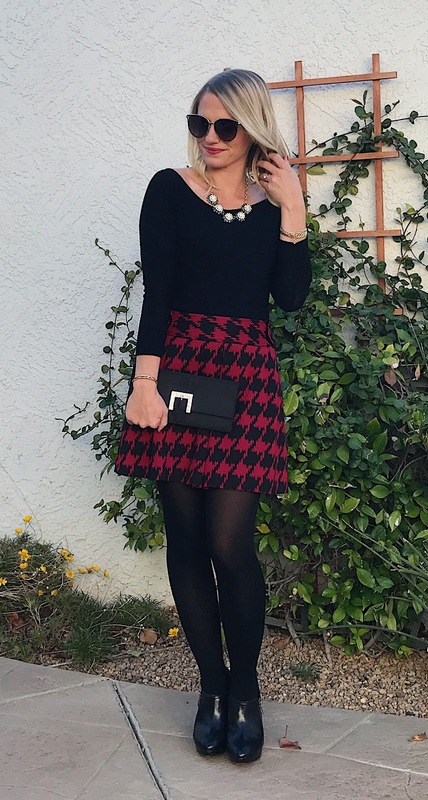 My Closet- Christmas Look with Red Houndstooth Skirt. Today I'm sharing my last outfit posts for this year. Blogging has been hard lately for me to keep up with. I'm surprised that I get out as many post as I do sometimes. I think that sometimes I put too much pressure on myself to get blog posts out and keep up with it all. It sometimes over whelms me too much and I don't like that feeling. I blog because I love it, but I do have other things in life that I need to tend to, and that sometimes comes first, especially when it comes to my family. 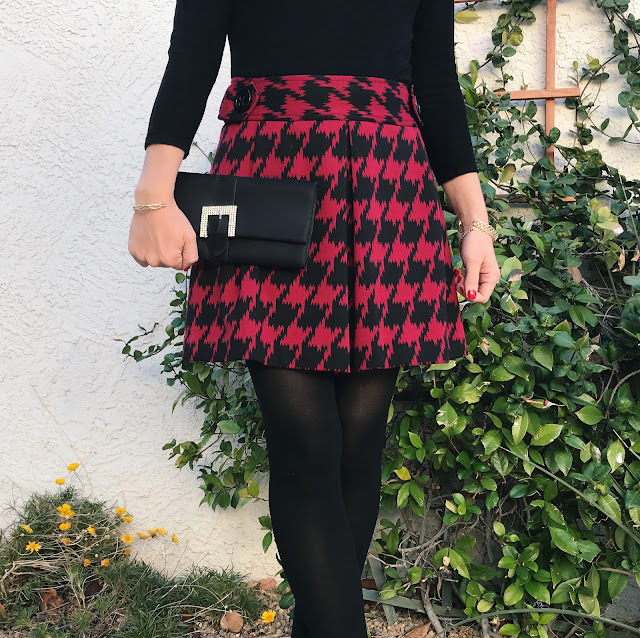 Before I take a little break, I wanted to share a Christmas look with this red houndstooth skirt that I've been dying to share. This skirt is from Express, but it was a thrift find by my mom who passed it down to me. I love it! It's the perfect winter skirt. I just love how this skirt looks with all back. To complete this look I added some sparkly accessories to make it perfect for Christmas. I love this black satin clutch with the rhinestone buckle. My statement necklace is from Rockbox. If you've been following a long with me on Instagram, you know all about how much I've been loving my Rockbox subscription. That's why I want to make sure and share my code for a free month of a Rockbox subscription. Go to Rocksbox.com and use my code thriftywifehappylifexoxo. I'm actually getting ready to send back this box and get a new set of jewelry for January! I can't wait to see what new designer jewelry I will get next! I LOVE that necklace with your outfit, it's the perfect accessory!